Ice climbing is a favorite past time of the ABAK team. 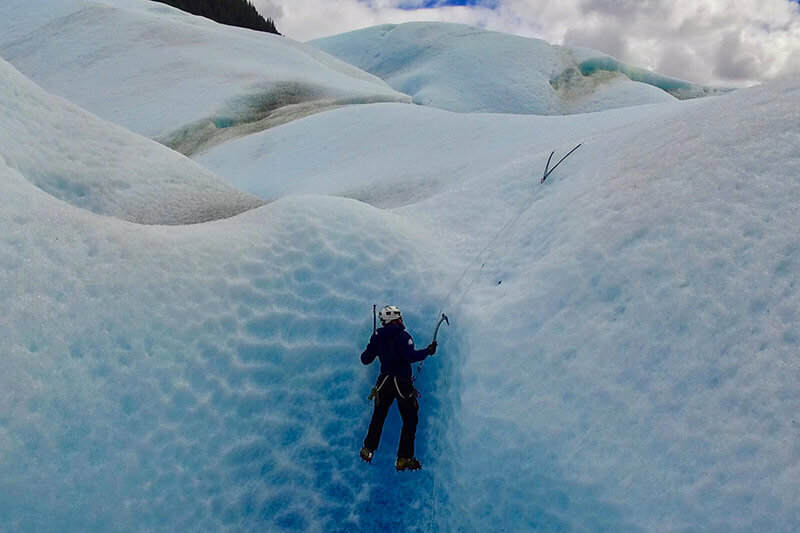 This unique sport combines some elements of rock climbing with glaciers and ice formations. 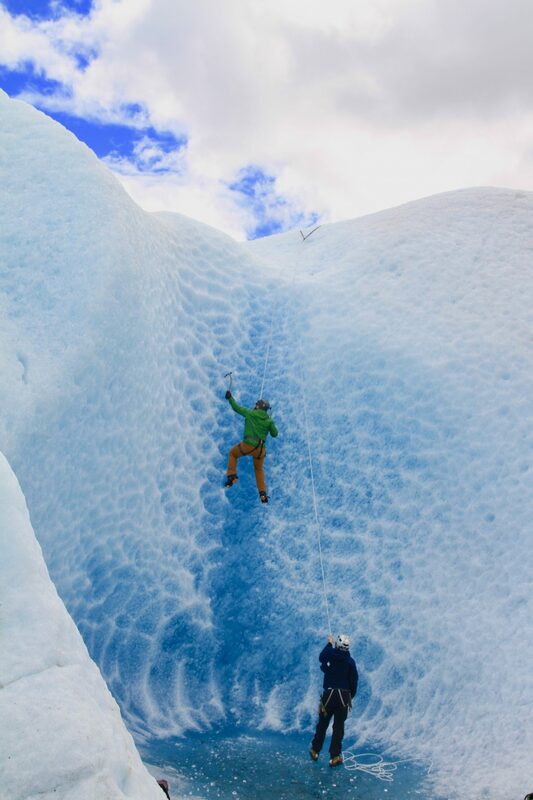 By learning ice climbing you can traverse a glacial environment and get to ice features no one else can see or access. And it isn’t very hard! Yes you need to be in good shape, but anyone can learn and try basic ice climbing. Want to explore the most area of the Mendenhall Glacier? 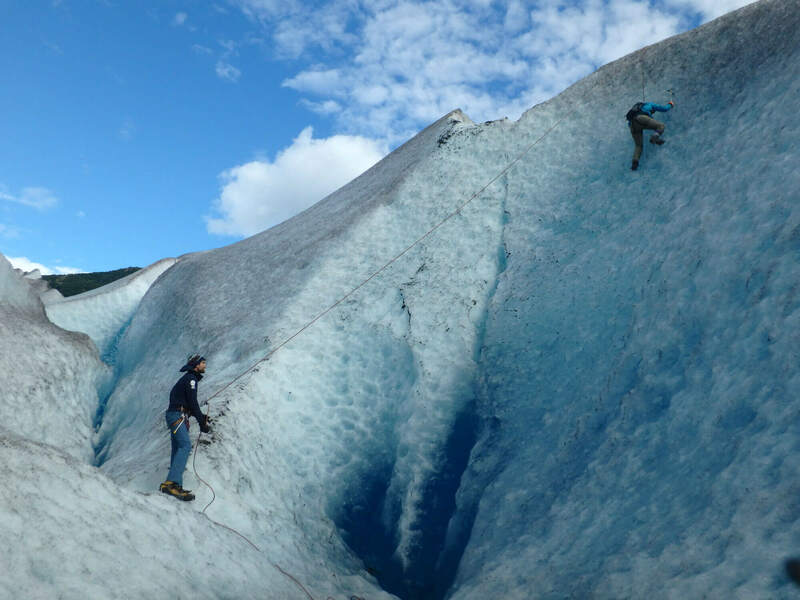 Join us for the Glacier Blue Trek & Climb! The longest glacier day tour in Juneau! Learn ice climbing, access remote features of the ice, and find those areas of the ice no one else gets to see! Below is an overview of the ice climbing gear we have chosen to use both personally and professionally. Please note: this is one opinion and we are not endorsed or paid for any promotion of one brand or another. All gear should be assessed by the user and the most important factor is you are comfortable with the gear you bring into the field. Boots – When selecting mountaineering boots for organizational use many companies choose a plastic double boot with toe and heel welts for fully automatic crampons. These boots can be great for climbing, but approaches become more than a chore. Many first time users find their ability to enjoy themselves hampered by the uncomfortable experience of heavy, ill fitted and rigid plastic boots. Plastic boots are often chosen due to their price point. They do everything just good enough and outfitters can purchase a decent inventory within organizational budget constraints. The mission I took upon myself was to find a boot that will improve on the novice ice climbing experience without the constraints and limitations of a plastic boot. Enter the Zodiac Tech GTX by Scarpa. Weight is comparable to a sturdy pair of hiking boots. During the extensive field testing I felt more free than I have ever felt wearing a pair of mountaineering boots. Long approaches? No problem. Shin bang from hard plastic edges? No longer an issue. Feet warm and dry? The Zodiac insulates reasonably well for a 3-season boot (the boot is not actually insulated). I do not recommend wearing this boot when the temps drop below 20 degrees Fahrenheit. The Zodiac exceeds my expectations since we rarely see temperatures below 40 during our operating season. The Zodiac is a remarkably walkable mountaineering boot. The sole is rigid enough for front pointing, but it also has enough give to allow the user to feel the ground when walking over bare rock or loose gravel. Because the Mendenhall Glacier has been in retreat since the 1700’s the hike out to the ice has gotten longer every year. Currently the hike one way is nearing 4 miles. I had to consider the fact that we spend more time on the approach to the glacier and walking around on the glacier than we do actually climbing. And finally the climbing. Scarpa is an industry leader in technical climbing footwear. The Zodiac lives up to the Scarpa name; when paired with a solid crampon the boot delivers climbing precision. I have used the Zodiac for several multi-pitch Water Ice 3 climbs and found that it was able to stand up to the test. For glacier travel and top rope climbing I am confident that the Scarpa Zodiac GTX will serve our clients well; most importantly, I found a boot that delivers both comfort on the approach and climbability in the vertical world. Crampons – I decided to pair the Zodiac with the semi-automatic Black Diamond Cyborg Crampon to take advantage of the heel welt. The Cyborg secures very tight to the boot allowing one to feel as if the boot and crampon are one unit. In the past I have had issues with crampon slippage when wearing semi-automatic crampons. The shape of the toe box on the Zodiac fits perfectly into the C-clip on the Cyborg providing rock solid confidence for the user. 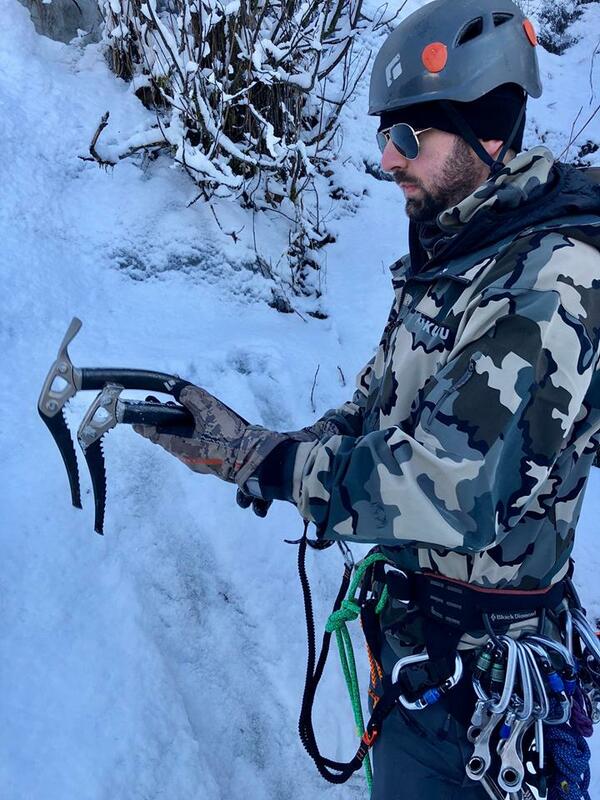 Ice Tools – I also chose to invest in some brand new technical ice climbing tools to take advantage of the recent advancements in outdoor technology. The Viper from Black Diamond and the Quark from Petzl are both strong showings. Both provide the climber with an ergonomic grip and a balanced strike. Both come in at just over one pound per tool making it easy for the novice climber picking up a tool for the first time to climb without fatigue. Black Diamond spinner leashes complete the ensemble so the climber doesn’t have to worry about dropping a sharp ice tool on their belayer. Elliott using the ice tools in the field. I’m confident that this gear will deliver the best possible client experience on our Glacier Blue Trek & Climb. Unfailing gear allows us to be safer in the hazardous glacier environment. Quality gear allows us to give the client an authentic experience of technical climbing (clients are using the same gear that ice climbers actually use for challenging ascents). Light gear allows newer climbers to climb more without fatigue and expend less energy on the approach to the climb.